After the bitter storm that was Avengers: Infinity War, the return of Ant-Man is a charming diversion of classic superheroism. The hero may not have as complex of a moral dilemma in his desire to do good, nor do his villains have all that grand a scheme to make them unique. But there’s a clear motive of fun here, and a heart that beats with family bliss throughout. Not all of it sticks, and it may take an easier route with its emotional edge, but hey—this is exactly what’s needed after something as earth shattering as the apocalypse of Marvel heroes. Paul Rudd slides back into the role of Scott “Ant-Man” Lang, and he hasn’t lost an ounce of his charm. Having been involved in the fallout of Captain America: Civil War, he’s back on the bad side of the law, but this time he’s under house arrest rather than in prison. Everything seems to be going fine, as he can still see his daughter and is mere days away from clearing his name. Meanwhile, everything is not so fine for former Ant-Man Hank Pym (Michael Douglas) and his daughter Hope (Evangeline Lilly). Sure, Hope has now taken on the role of the more mobile size-shifter, Wasp, but she and her dad are currently on the run from the law because Civil War ruined everything. No matter. They’re still devoted to constructing a quantum machine to delve into the subatomic universe, where Hank’s wife and the former Wasp, Janet (Michelle Pfeiffer), disappeared decades ago. They may need Scott’s help, since he’s already been there once. Of course, there are others after that universe-twisting technology—too many, as it turns out. Ghost (Hannah John-Kamen) is a phase-shifting supervillain who wants that tech before her name becomes too literal. Jimmy Woo (Randall Park) is a nosy FBI agent trying to keep a strict eye out for Lang and Pym, always one step behind them. Sonny Burch (Walton Goggins) is a shady weapons dealer who wants to make a mint from that quantum gold. And that’s to say nothing of Hank’s bitter ex-partner, Dr. Bill Foster (Laurence Fishburne), and Scott’s unpredictable partner-in-crime, Luis (Michael Peña). 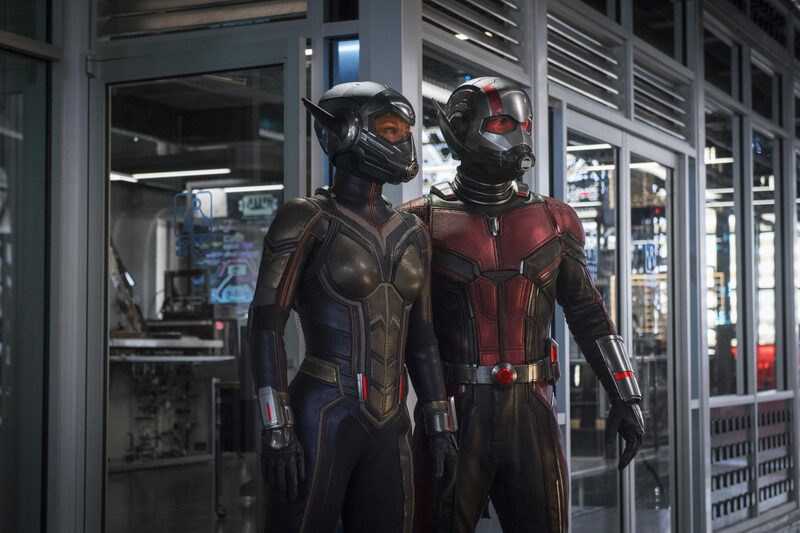 The movie was screened in IMAX 3D, and unlike a lot of films that come bundled with the gimmick, Ant-Man and the Wasp is perhaps the type of cinema best suited for this process. The many action scenes featuring the shrinking and growing of the titular duo are visually impressive, with great use of scale and depth of field to create a dizzyingly exciting spectacle. The film has a lot of fun with Hank’s new hobby of shrinking cars, leading to some exciting chases, and there are some uncomfortable encounters with birds. There’s also more fun to be had with Scott’s malfunctioning shrinking suit, leading to the most hilarious of size-altering moments that find him running around as a pint-sized Rudd who could blend into a kindergarten class. Surprisingly, the 3D adds more to unforgettable scenes of the shrunken Wasp dashing across knife blades and the supersized Ant-Man rising out of the water. The only time this visual gimmick becomes confounding is with the phasing powers of Ghost, whose physical form seems to echo with translucent shadows of herself in various states. Her unique powers always left a question in the back of my head as to whether I was seeing the visual effects of her powers or a misalignment of the 3D layers. Ant-Man and the Wasp, much like its hero, has far too much going on but ultimately aims to do the right thing and does it rather well at times. It never digs too deep into its characters, portraying Scott more light and laughable than conflicted in his roles of dad and hero, and always lovable. It’s a pleasing breath of fresh air from the Marvel Cinematic Universe, infusing a little bit of that simpler superhero sweetness after the denser and more profound films of the franchise. You gotta have a little bit of fun with a tale of ants and quantum science before going back to a world of ash and death, making the final song choice of the Partridge Family’s “C’mon Get Happy” all the more fitting.